A stop light is supposed to tell you when it’s safe to go forward. If the light is green, it’s safe to proceed; if it’s yellow, slow down and be prepared to stop. If it’s red, full stop and wait for the green light. It usually takes about two minutes to cycle through all three colors -- about the same length of time as a TV commercial break. Not too long to wait (on a good day), right? Occasionally, you find a light that doesn't change that quickly. It could be because of traffic flow — if you’re on a side street crossing a major thoroughfare, for instance. Or maybe a police car or ambulance is headed towards the intersection, and the light holds traffic in all directions until the emergency vehicle clears the intersection. But sometimes, the light is simply broken. It's stuck on red or it's flashing red in both directions, and you can't just keep waiting for the light to turn green; you have to decide for yourself when it’s safe to go forward. Fear is a lot like a broken red light. But I think fear is much less reliable than the average traffic light. Fear has some programming bugs that cause it to switch to red too often and keep you stuck for too long. Think about how often you stop yourself from taking a step or making a decision simply because fear pops up as soon as you start to have an idea about something. A reasonable amount of fear is healthy. It’s not a bad thing that fear kicks in when you’re about to do something that could literally kill you, but realistically, the typical day-to-day choices you’re faced with are not even close to that level of risk. Usually, you’re just trying to figure out whether it’s a good idea to say yes to a public speaking gig, or if you should ask someone if they want to be your client, or maybe you’re trying to decide whether you should upgrade your email list service to the paid version. Not exactly life and death decisions, but your alarm gets tripped so you start worrying. And of course then you stop, because the light turned red. Sometimes, the light is just broken. If you let fear make your decisions for you, you could be stuck there waiting for the light to change for who knows how long. Turning the light red is what fear does really well. But back to green -- not so much. Sometimes the light is just broken. And you've got to make a move. That doesn't mean hit the gas and hope for a miracle. By all means take reasonable precautions; inch forward, look both ways, and use your common sense, etc. But don't just sit there waiting for the fear to give you a green light, because that's not what fear does. Make your move! 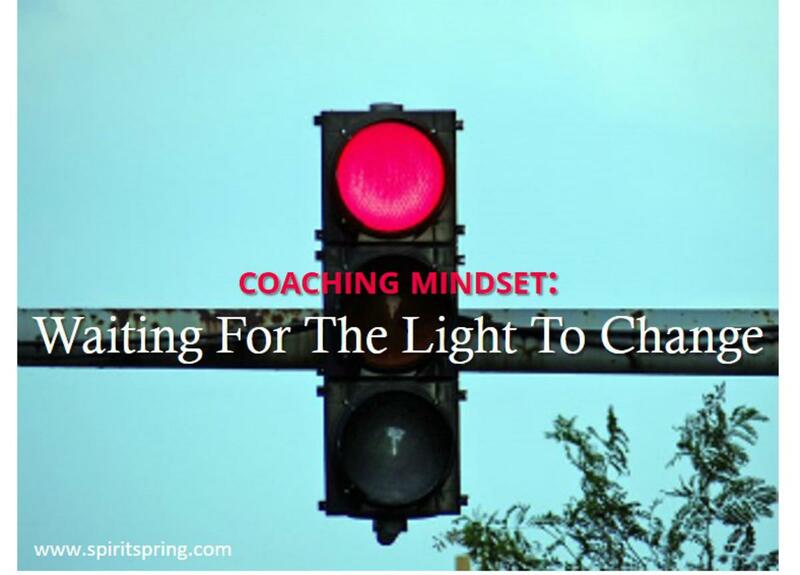 Need a fresh perspective on what's keeping you from coaching your best? Book a free 30-minute brainstorming session with me. No charge, no strings, no pitch. Click here for more info.